Chariots On Fire, no not the movie but the gay sauna located in Shoreditch, East London. It was severely damaged in a fire in the early morning hours of March 20, 2011. By the time fire-fighters arrived on the scene more than 150 men had been evacuated without sustaining any injury. The alarm went and everyone rushed towards the main exit. I was surprised by how quickly the fire spread – it was frightening. At first there was a trickle of smoke and within a couple of minutes that turned into a thick, black towering column of smoke – you could barely see anything else. It took more than 30 fire-fighters to get the blaze under control. 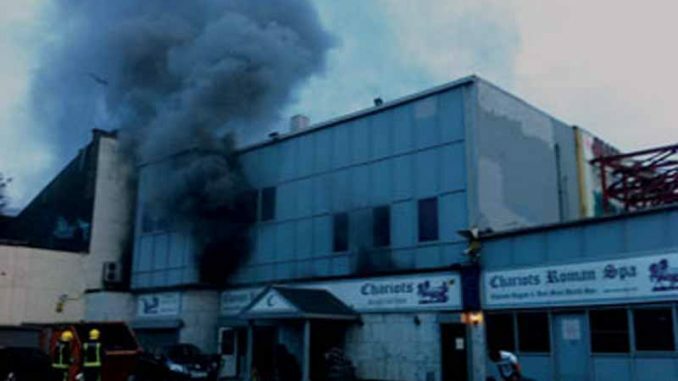 When the smoke cleared much of the ground floor of the business was destroyed by the fire. We believe it was an electrical fire but it’s still being investigated,” he said. “We’re getting our act together in the next couple of days.